Looking for hard pack tire? 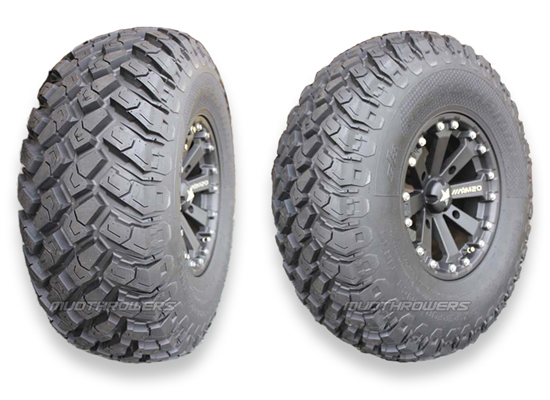 EFX MotoHammer tires look similar to BFG Mud-Terrain or Nitto Trail Grapplers, only are designed for SxS's instead! MotoHammer features a non-directional high contact patch tread that provides superior traction in hard, intermediate and light sand conditions. Racers and high speed enthusiasts will appreciate the high speed rating and radial technology. Trail riders will appreciate the rugged 8 ply rated casing, deep lug, and soft compound that conforms to terrain. 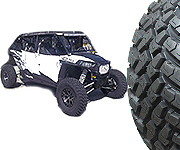 MotoHammer provides a very comfortable ride and feature a heavy load rating at 1,000 lbs per tire. Perfect for heavier UTVs and Side-By-Sides. The lugs are incredibly strong and the tire features build in rim guard and wrap around shoulder lugs. Smooth high performance handling and traction! 8�Ply Rating, DOT approved radial!